Microsoft Surface vs Apple iPad Keynote Video — This video was made available last week and is very intriguing look at how close the Microsoft Surface Keynote and Apple iPad Keynote are similar. Microsoft stealing Apple’s Keynote terminology. A must watch. This video was made available last week and is absolutely hilarious. 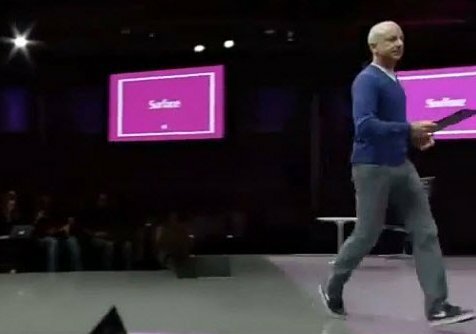 It’s clips comparing the iPad (first gen) keynote by Apple’s Steve Jobs and Microsoft’s Steve Ballmer and Steven Sinofsky doing their keynote showing off the Surface tablet. A lot of similarities – but Microsoft is stealing from Apple way to late. This is a must watch for any geek who follows the Microsoft versus Apple Rivalry. What is your take? It’s very interesting to see the similarities and Microsoft ripping off Apple’s terminology. Seriously? Ripping off apple? Why is it that once apple makes something anything after is “ripping off apple” but no one says apple ripped off others to come up with their products? MS created the tablet market from what I remember and Jobs got the idea for the ipad form an MS employee that told him about the courier project. And all “ultrabooks” are a ripoff of the macbook air. . . but it’s a ripoff of Sony’s ultra-portables. . . and it goes on and on and on. Apple has NEVER had ONE single original idea all their own. If they had you could bet they would have been able to block everyone else from the market. Great points and I love the photo. I wonder how many ideas have been inspired by Early SciFi tv and movies. What Apple did innovate on however is the single touch apps and simple design with the app store. I think Microsoft made the mistake of trying to keep Windows alive and failing to realize its not about the OS, it’s about the App. iOS focuses on the app and hides the noise. Jean-Luc Picard for the win! @AppleFUD I love you micro-softies! You’re funny! Looked at your cute little picture. The only thing it showed was science fiction, a “not ready for prime time”, THE MARKET MAKER, and a ho-hum me-too that won’t ship until – when. Who was it that came up with the iPod? The iPad (that SOLD)? The iPhone? The MacBook Air (the real Computer one, not the Sony-toy). More important, who knows how to announce, deliver and SELL products that Work, are Easy to use, fun, and have more (apps) capability than than all the neurons in your medulla oblongata? My iPad is great until I want to do something productive or easily transfer files or actually use it for anything much beyond consumption. The second the Surface hits the shelves, it’s mine.